At the Centeno-Schultz Clinic we understand that hip pain can be debilitating. Hip pain can arise from osteoarthritis, avascular necrosis of the femoral head(AVN), labral tears and fractures. Stem cell treatments are an alternative to traditional hip surgery. Trochanterteric bursitis is an inflammation of the bursa on the outside aspect of the hip bone (greater trochanter). The bursa, a fluid filled sac lies between the insertion of the gluteus medius and gluteus minimus muscles into the greater trochanter. Other causes of lateral hip pain include inflammation(tendinitis) and degeneration(tendonosis) of the tendons. MSK ultrasound is an office based evaulation at the Centeno-Schultz Clinic that allows for accurate diagnosis and treatment. Trochanteric bursitis can be distinguied by diagnostic ultrasound so that appropriate therapy can be understaken. Therapies include prolotherapy, PRP and Regenexx platelet derived therapies. 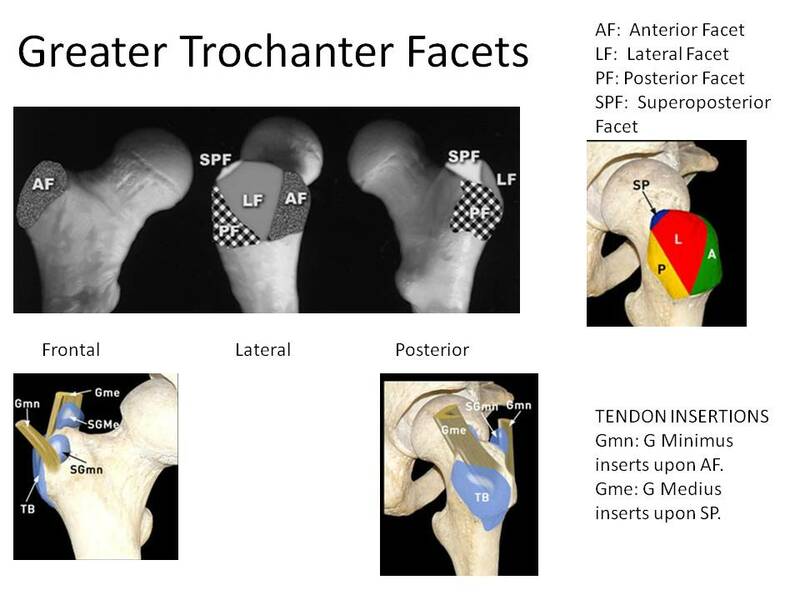 Below is a illustration of the 4 surfaces on the greater trochanter and the insertions of the gluteus medius and mimimus tendons. An arthrogram is an x-ray procedure whereby contrast is injected through a needle into a joint. Contrast in the joint confirms that the needle is in the correct place. If the needle is not appropriately placed, the injected contrast with NOT fill the joint space but rather will fill the adjacent tissue (muscle, ligament and tendon). Rather than outlining the joint, the injected contrast will look like a blob. Accurate placement is essential for both diagnostic and therapeutic injections. If a given joint is suspected to be the source of pain, it is essential that the needle be in the joint and the local anesthetic injected go into the joint and not the adjacent tissue. The only way to achieve this is with an arthrogram. PRP, prolotherapy, adult bone marrow derived stem cells, adipose derived stem cells have significant healing and regenerative properties. Accurate placement of the injected therapy is critical for maximal clinical success. That this why at Centeno-Schultz Clinic injections are guided by either x-ray or ultrasound. 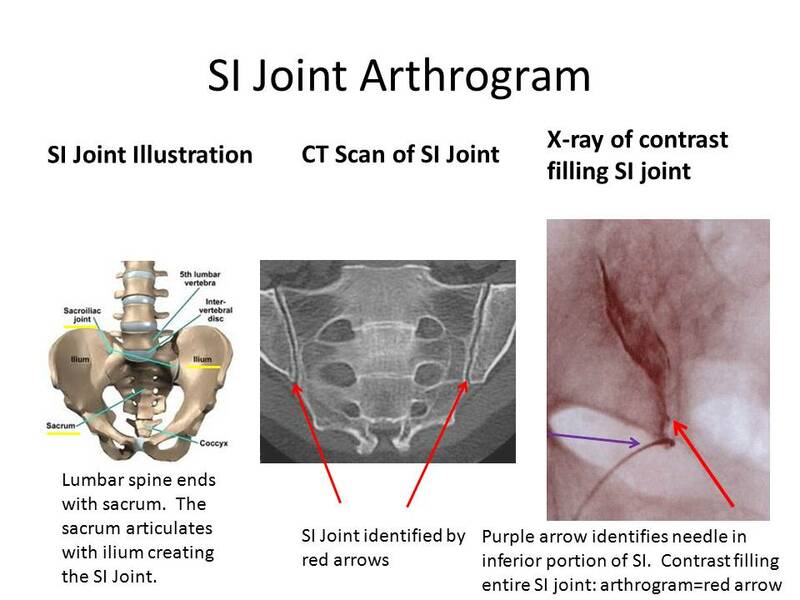 Below is an illustration of an arthorgram of the SI joint. Filling of the joint with contrast is essential prior to injecting any medication or regenerative therapy. Today after completing a full NFL practice and physical examination by team physicians, Jarvis Green signed with the Houston Texans. 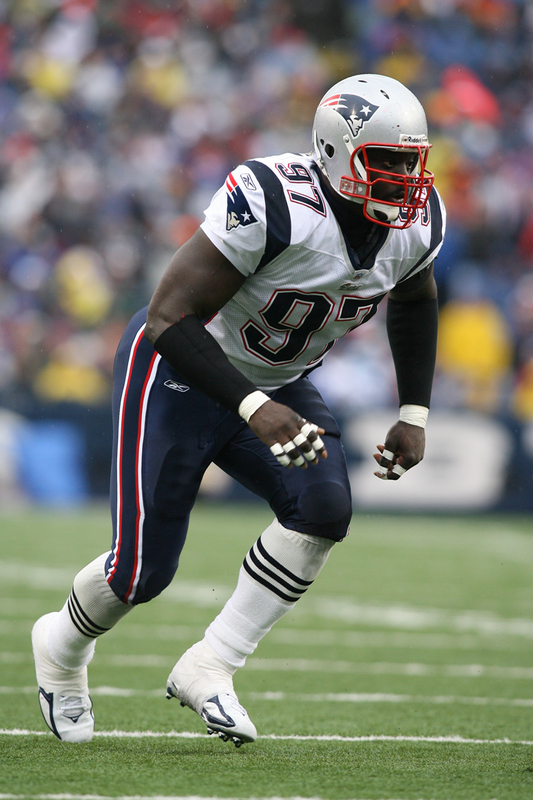 Jarvis is a two-time Superbowl defensvie lineme champion who played for the patriots from 2002-2009. Plagued with knee pain after failed lateral meniscus knee surgery, he elected to use the Regenexx procedure which allowed him to use his own mesenchymal stem cells. Jarvis underwent Regenexx-C therapy in July 2010 immediately prior to Bronco training camp. Unfortunately, he was cut at the end of training camp. Jarvis recently underwent additional therapy at the Centeno-Schultz Clinic which dramatically improved in knee pain. He underwent Regenexx SD, and Regenexx PL which made the critical difference. His performance today was without any limiations. We are tremendously proud of Jarvis and his return to his passion. What a wonderful holiday gift and blessing! The Regenexx procedure has once again made the headlines. The Regenexx procedure allows patients to use their own bone marrow derived stem cells for common orthopedic conditions. It’s a valid medical procedure right now,” said Dr. Christopher J. Centeno, medical director of the Centeno-Schultz Integrative Pain Management Clinic. For many patients it can mean avoiding surgery and months of rehabilitation with a procedure that just requires a few needles of treatment. Stem cell function continues to be a topic of intense research. Stem cells play a key role in cellular repair. “The body is in constant need of repairing itself,” Centeno noted. What’s more amazing than the differentiation, he said, is the ability of the stem cells to direct other cells and their traffic needed to complete the healing, or what he calls the “Bob the Builder” factor. Today I saw a patient back in clinic who was quite upset 9 months ago. He had fallen and fractured his tibia and fibula which required a surgery invovling placement of a rod and two screws. Despite surgery and a bone stimulator, the fracture did not heal. He was so upset at the prospect of undergoing another surgery where they had planned on removing the existing hardware and re-breaking the bones in an effort to stimulate healing. Fortunately the surgery was not needed. The patient utilized his own stem cells through the Regenexx procedure to heal the fracture. He is out of his wheelchari and has no leg pain. Regenerative Sciences enable patients to utilize their own stem cells to heal a variety of orthopedic conditions. Many factors play role a role in the healing process. Mesenchymal stem cells have a repair function in bone, ligament, cartilage and intervertebral discs. In previous blogs, I have referenced medication interactions on mesehcnymal stem cell function. Clinically there is often a difference among woman and men. Strube et al, examined whether there was a gender difference in bone healing and whether this process was associated with a difference in the total number of mesenchymal stem cells. In this study, females demonstrated compromised healing and radiographically delayed bone formation when compared to males. These differences were associated with a reduced number of mesenchymal stem cells which were postulated to be the possible cause of poor bone healing. Stem cell function, interactions with medications, gender and age related differences are areas of keen interest. Regenexx, which utilizes a autologous mesenchymal stem cells for orthopedic applications, has an extensive data base tracking these variables. This database hopefully will continue to shed light on these critical factors. All too often medicines have harmful side-effects. Vioxx and Bextra, previously common NSAID’s, were taken off the market because of serious side-effects. Medicines can have harmful effects on patient cardiovascular, pulmonary and GI system. Can medicines have an effect of stem cell production? Deng et al, demonstrated that aspirin inhibits stem cell growth. Regenerative Sciences understands the importance of medication on mesenchymal stem cell production. Patients that undergo the Regenexx procedure for orthopedic applications are counseled about the impact that specific medications have on stem cell production. One of the many medications which is restricted is aspirin. When teams from sea level play our Broncos they come early so as to acclimate. Denver is the mile high city. Travlers headed to Machu Picchu stop at Cusco to acclimate. So to with stem cells. Degenerative joints, knees and lumbar discs are tough environments. They have poor blood flow, low oxygen content and limited nutrients. Stem cells need to be prepared for such a task: pre-conditioning is essential for maximal results. Rosova et. al. demonstrated that when mesenchymal stem cells are pre-conditioned in low oxygen environments their tissue regenerative potential is improved. Regenexx employs this technique to ensure the best clinical results in patients who are undergoing autologous mesenchymal stem cell therapy for orthopedic conditions. A case series outlining the results of patients who underwent stem cell therapy for symptomic lumbar disc protrusions was recently represented at the National American Society of Interventional Pain Physicians. The abstract is #8. Patients utilized their own stem cells which were expanded and then re-injected into the painful disc. A majority of the patients had a significant reduction in their symptoms as well as changes on MRI. The Regenexx procedure affords patients an alternative to the risks of surgery and anesthesia. In contrast to conventional surgery, there is no significant down time or need for extensive rehabilitation. Currently there are numerous ways in which stem cells are being administered. When injected intravenously a majority of the stem cells are trapped in the lungs. When treating cartilage defects, does it matter how the cells are injected? Koga et al.,clearly demonstrated that it does matter. He injected cells in a variety of ways including into the joint vs directly into the cartilage defect. Cells placed directly into the cartilage defect resulted in more than 60% of the stem cells adhering to the area of damage and significant cartilage growth at 24 weeks. A Colorado practice utilizes intermittent x-ray to inject autologous mesenchymal stem cells directly into areas of cartilage damage. This technique avoids the risks and time associated with traditional surgical approaches. MRI images before and after stem cell therapy tell the story.